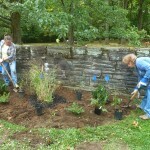 For our 5th National Public Lands Day on Saturday, September 26, we installed wildlife habitat plantings at the lovely Kirk Lane entrance to Glen Providence Park! 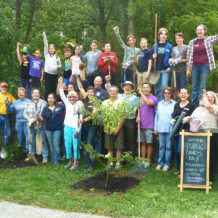 On the day of Pope Francis’ visit to Philadelphia, 33 adults, teens, and children volunteered a combined 116 hours digging, planting, mulching, installing deer fencing, raking, and watering! It was a fun and fulfilling morning spent with wonderful people. 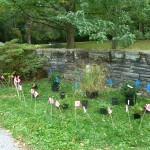 We planted 31 native trees and shrubs, and over 24 native perennials – the complete list is below. The plants benefit wildlife by providing seeds, nuts, fruits, and nectar for mammals, birds, butterflies, and other pollinators. We planted milkweed specifically to help the Monarch butterflies – milkweed is the larval host plant for their caterpillars. 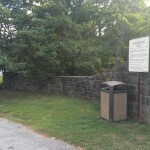 As the Delaware County Conservation District pointed out, the plantings should also help slow down and absorb surface storm water runoff that might be flowing off the Kirk Lane road surface into the park. 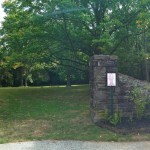 The Kirk Lane entrance felt like a fitting planting location in this 80th anniversary year for Glen Providence Park. 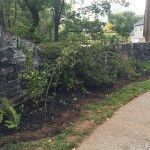 The trees in the lawn area replace trees that had fallen, shrubs along the lawn edges extend wildlife habitat areas, and the planting beds in front of the entrance wall benefit pollinators and beautify the entrance. 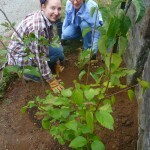 The Blueberry shrubs and Serviceberry and Pawpaw trees also produce fruit edible by humans! 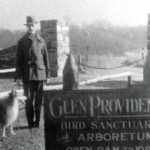 We left room in the right planting bed to install a replica of the original 1930’s “Glen Providence Bird Sanctuary and Arboretum” Kirk Lane entrance sign, which you can see in the gallery below. 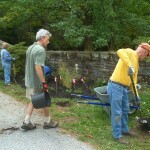 We love the community spirit at these planting events, which extends past the planting day. 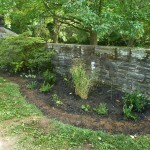 Several local residents remarked how they would continue to enjoy the plantings, and thanked us for our project. 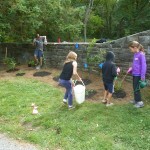 The day after the planting, we discovered an Upper Providence resident who had asked permission to run a 150’ hose from a house neighboring the park, and he was watering the plantings! We greatly appreciate this generous and helpful act. We have so many to thank for their help with this project… starting with all those volunteers! 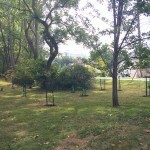 Delaware County Parks & Recreation provided the funding for the plants and donated the deer fencing. 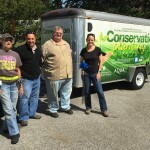 Taylor Memorial Arboretum donated native trees, shrubs, and perennials again this year, and Delaware County Conservation District delivered their Conservation Planting Trailer full of all of the tools and supplies we could need! 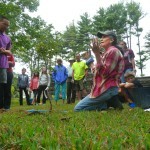 Garden Influence and Redbud Native Plant Nursery provided expertise, and Media Providence Friends School students are preparing plant labels. 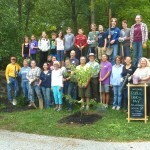 We are grateful to all of these people for making the plantings possible! 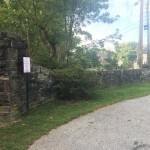 The next time you are at the Kirk Lane entrance, look for these native plants, and check out the fun in the photos below – just click on one to scroll through them. Thank you to George Tate and Marcia Tate for the wonderful photos of National Public Lands Day. 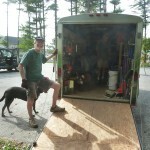 The amazingly-stocked Conservation planting trailer! 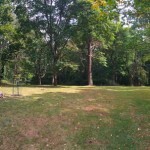 Panorama of the lawn – they’re hard to see, but we planted 6 trees in there! Additional before and after photos by author.